At Running Solutions we provide a detailed analysis of your running biomechanics and also perform a movement assessment/functional movement screen. Through this we identify your weaknesses and movement issues. We welcome beginners, recreational and elite athletes who are carrying injuries or niggles associated with running. Our assessment will facilitate you maximising your running potential through improved running technique and strengthening. It is important to recognise that 76% of runners will pick up an injury annually. As most running injuries are related to inefficient movement patterns, Running Solutions can provide you with a foundation in running technique and reduce the risk of injury. 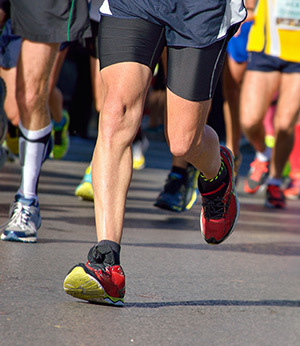 For an injured athlete or athlete returning to running following an injury we can review your performance and provide advice on technique, improved strength and facilitate recovery. We also cater for the runner who feels that their running has stagnated and are finding it difficult to run faster. Our assessment of your running mechanics and movement screens can isolate dysfunction and allow us provide a solution. Video Analysis of your running technique- ‘Biomechanical assessment’. Movement screen/Functional movement analysis- used to assess and isolate of inefficient movement and weaknesses. Individual instruction with regard to running technique and provide a specific rehabilitation program. When required direct physiotherapy treatment may be required to alleviate pain. Combining knowledge of human anatomy with knowledge of human movement to establish movement impairments associated with pain & dysfunction.